Table linens are one of the greatest assets to decorating and creating ambiance. When you are dressing a room for a special occasion, table linens can be used to draw multiple elements together within the room. They set the stage, so to speak, and it is important to choose them wisely. Colorado Party Rentals has quality linens for every occasion, today we have a few ideas to help inspire you for your special occasion! Take a look at our designer linen collection and be inspired with what you can do! The right tablecloth accents the main color of a theme or setting. When you add a tablecloth you are adding visual weight to a room’s décor. The visual weight relates to the proportions of the room. In a large room, keep the table setting from getting lost by using cloths woven with large, compactly arranged patterns which conveys a visual weight. The tablecloth shown would be an example of one that carries a heavy visual weight. In small rooms, lightness is suggested by using a tablecloth woven in an airy pattern. The color of the tablecloth is a tool that is used to alter the mood of a room or setting without changing the tableware. In a formal setting, the colors used are typically white, ivory, and ecru. Sometime pastel colors are often used as well. With informal dining, you can use various shades to create the ambiance you want. Brighten up a table or an entire room with a patterned tablecloth. By introducing a texture or a pattern will help liven the party by giving depth to the table setting! Layering tablecloths, table runners and napkins brings a designer look to your table setting. Set a stylish table with choosing multiple sizes in tablecloths. The bottom one should fall as close to the floor as possible. The second one should cover the table and fall about 12 inches off the side. Top it all off with a table runner down the center of the table, or several shorter ones laid across the width of the table. Call Colorado Party Rentals to Book Your Special Occasion Today! Colorado Party Rentals in Denver gives assistance in planning and creating your order to achieve the look that you want. 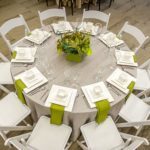 No event is too big or too small for personalized attention and we will work with you over the phone or on-site to provide you with your choice of the broadest range of equipment in the region, from specialty linens, tables, chairs and china to tents and tent structures. Looking for something you do not see on our website? Just ask. Our inventory is constantly being updated to reflect the requests of our customers and the newest trends. Call today!